When you add whisky to a pan of chicken breasts, it makes a fine blaze. The whisky flavor lingers in the pan juices, making a tasty sauce with lemon and honey – the classic trio in a hot toddy. My mother once tried to raise guinea hens, tiresome birds that made a lot of noise and were hard to catch as they persisted in roosting in the trees. So when I moved to France and found guinea hens ready-prepared in the local market I was delighted. 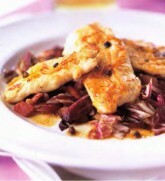 They have much more taste than a chicken and handily replace game birds such as partridge and pheasant. If you cannot find them, use a small chicken instead. This charming, rustic recipe comes from Bartolomeo Scappi’s Opera, one of the outstanding cookbooks of the Italian renaissance. Everything is simmered together until the duck meat almost falls from the bone and I’m always astonished by the potent, spicy sauce with its underlying sweetness of dried fruits. Scappi does not mention salt, but instead adds ham in much the same way that Italian cooks today season with grated Parmesan cheese. I’d strongly advise cooking the duck ahead — the spices blend and mellow, while the fat that rises to the surface of the sauce during cooking is all the easier to skim after it has solidified in the refrigerator. 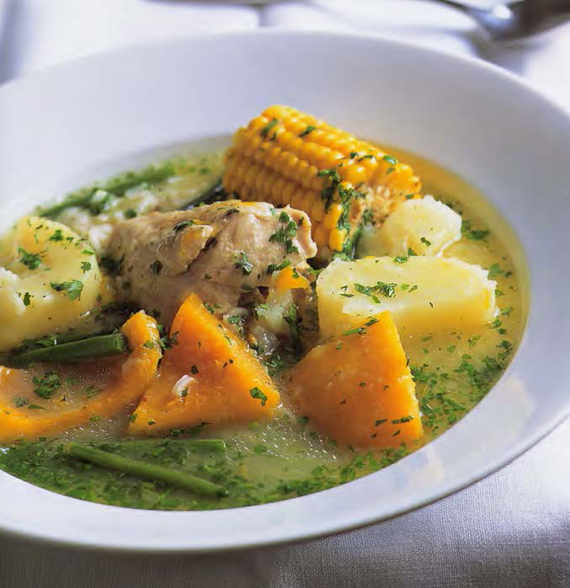 Cazuela means casserole in Spanish and this rustic dish is a classic one pot meal, half chicken soup, half stew. Pumpkin, potatoes and corn are a traditional part of cazuela, and green vegetables can vary with the season. 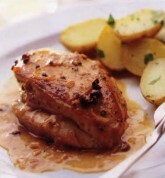 The cooks of the Burgundian town of Chablis, famous for its white wine, like to cook meats in a rich white wine sauce with juniper and shallots. I tried it one day with chicken breasts, great winter fare! 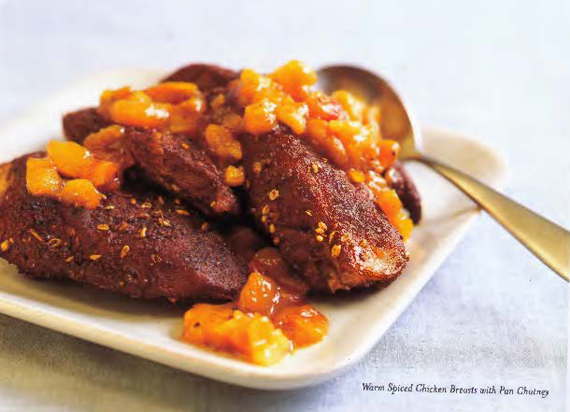 Chinese five spice powder is one of my secret weapons – it adds a warmth and depth of flavor that is quite different from curry powder. The key flavorings are cinnamon, star anise, fennel, clove and Sichuan peppercorns, but like curry powder the exact mix varies from brand to brand. 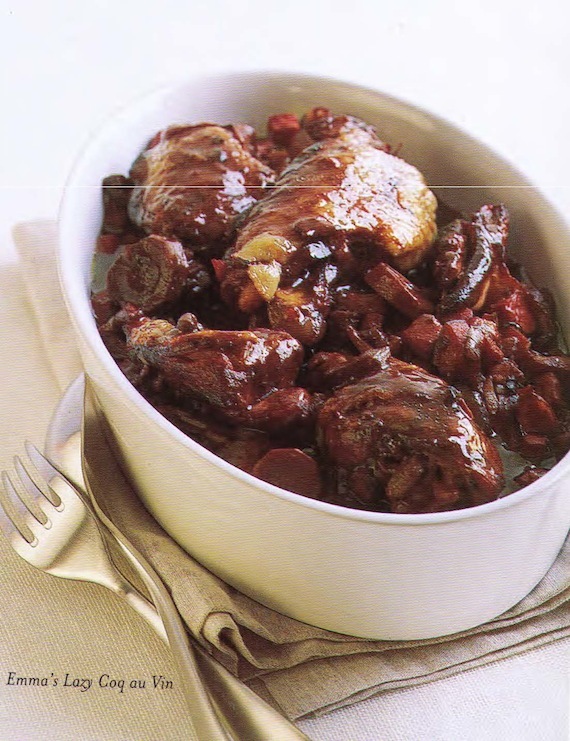 There’s no way I could persuade Emma to spend the three days needed for a classic coq au vin. Instead she’s devised this version that has the flavor of the original with far less work. When she’s really short of time, she cooks the chicken without marinating, and it is still delicious. 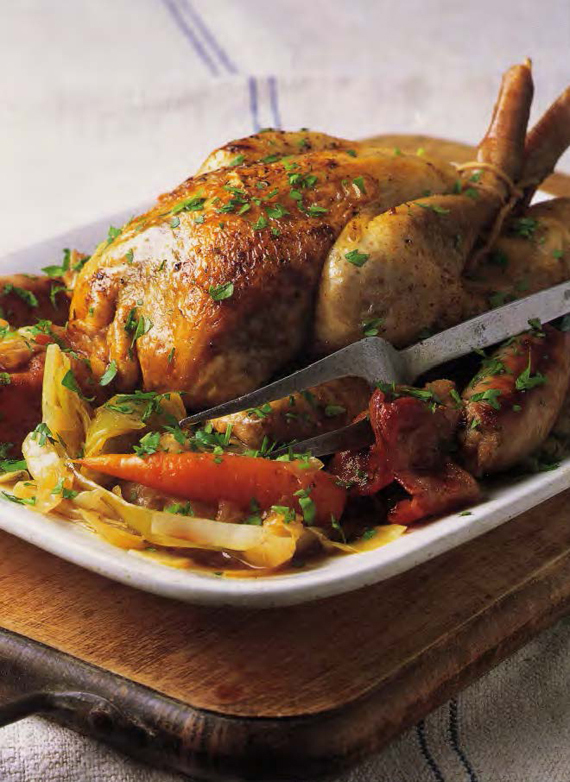 Roast goose is a reason to celebrate and here’s a splendid Alsatian recipe in which the bird is basted with beer so the skin darkens and the gravy toasts to a deep caramel. Whole apples cooked in the cavity add unexpected flavor and emerge tasty and hot, ready to serve with the accompanying rutabagas and Brussels sprouts. I look for a goose with creamy white skin and plump breast meat that almost conceals the breast bone. Even then, a 10-pound/4.5-kilogram bird only serves 6 people. In compensation, a goose renders quantities of superb fat for frying potatoes. 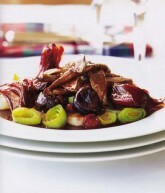 Thanks to the popularity of foie gras, we have magret—the robust breast meat of a fattened duck (the legs go for Confit). Magret has become an up-market steak, particularly in southwestern France, and in the pan behaves very much the same way. When pleasantly pink, the meat is rich and juicy, but be warned that overcooked magret tastes, and cuts, like shoe leather. I like it best with a sauce of seasonal fruit, starting with springtime cherries, moving through apricots, tart berries such as blackcurrants, to apples, figs, and winter dried fruits. All of them can be substituted for cherries in this recipe. An appropriate wine would be a fruity Merlot or Gamay. 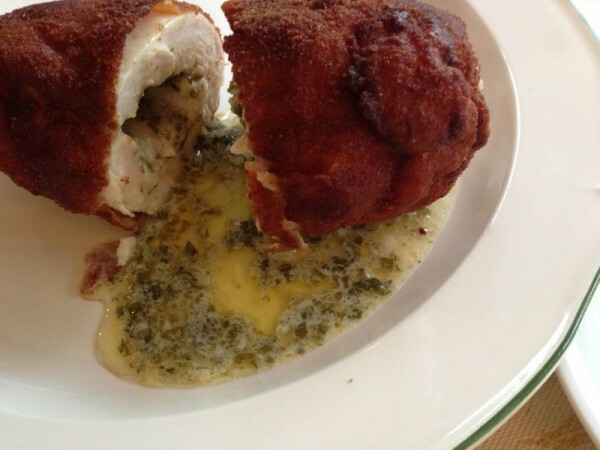 In general, a magret serves one person, but a very large one can sometimes be enough for two.